The Creepers are exactly what one might expect from a member kicked out of The Fall (guitarist / keyboardist Mark Riley) for rumors that he was too melodic for the band. I also suspect from listening to the lyrics that his sense of humor may have been to flamboyant for Mr. Smith's taste. 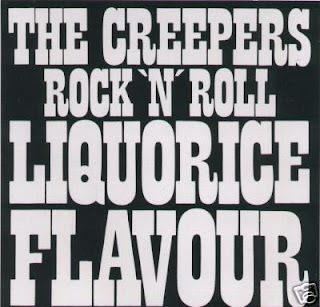 Liquorice Flavour is The Creepers' final record (1987) and is arguably their best. While the instrumentation is absolutely more melodic and straight rock rock than his previous band, The Creepers vocals see saw between spoken word through what sounds like a telephone and flattened half melodies. There are Fall-esque moments to be found on this record but I can't help but be reminded of Sonic Youth minus the chaotic guitar acrobatics (add sax and accordion). Last but not least there is a stellar Pretty Things cover of "Rosalyn" which is worth the price of admission alone. The Creepers are a weird combination of commercial and cool - Hoodoo Gurus meets the Television Personalities on steroids and there you have it, The Creepers and a great record from front to back.